Waco Jesus is an American grindcore/brutal death metal band, founded 1994 in Illinois. The name Waco Jesus refers to a massacre commited February 28th 1993 by the Federal Bureau Of Investigation to a group of religious fanatics in Waco, Texas. Original lead vocalist Jim, was a crazy mofo and was seen once at a Terata (IL, rip) show in Indiana destroying a pit full of death metal enthusiasts and screaming "I'm Jesus!" at the top of this lungs. Combining the Waco incident with the horrifying cries of Jim, guitarist Paul Gentile and drummer merd of Terata declared: "Jim, if you ever start up a band, it needs to be called Waco Jesus." Waco formed initially by Kevin Mensen and Crazy Jim set out to upset people and disrupt the peace with the most extreme and sick sound they could create... and the visual presentation of flyers, artwork and album covers were no exception. With the initial demo songs being laid out by Kevin and merd, the songs evolved with addition of new drummer Jason Crum and later Takashi Tanaka. 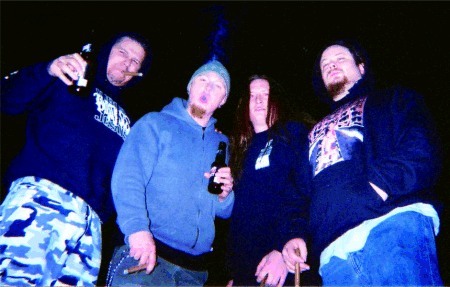 The initial demo containing four tracks were rerecorded for songs appearing on Destruction of Commercial Scum which contained a new lineup of musicians, keeping Kevin as the core member.